see the Satras there.Hearing this Mr . Bharali suggested that we visit three hundred and fifty years old Sri Sri Iswarhatisatra which is famous for it’s great wood carvings and paintings.We readily agreed to it and soon followed Mr. Bharali as our guide. (In the picture : Mr. Bharali ). 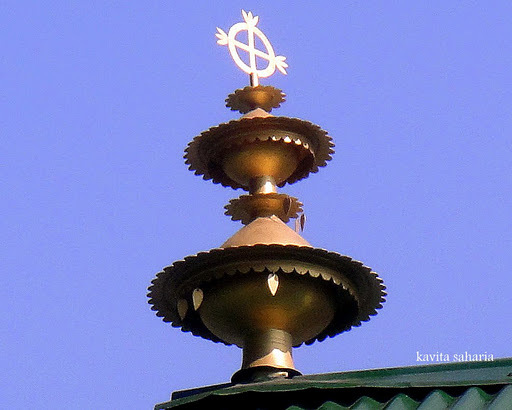 A Satra has been defined as:-ekanta vaisnava yot nibasa karai . 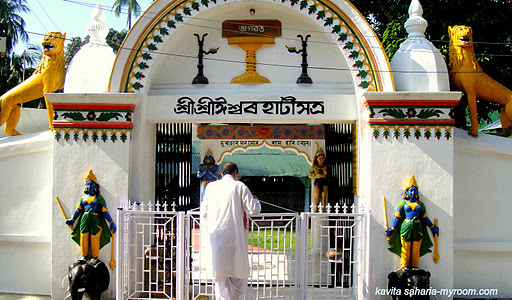 jibako saran diye, tak Satra kai – which means Where the single-minded Vaishnavas reside,where they offer shelter to the souls, that place is called a Satra.They are of great importance because of the fact that they contain manuscripts, artifacts and antiques of immense historical value. Here we were introduced to the present Satradhikar or the head of the satra.. The bhakats, monks, live here under the guardianship of the Satradhikar .All important activities are conducted under his guidance and supervision.He told us that by calculating working years of different Satradhikars the estimated age of this Satra is over three hundred fifty years old .In the Satras, the Nama Prasanga/prayers are generally held three times a day.The most sacred space is the Manikut . 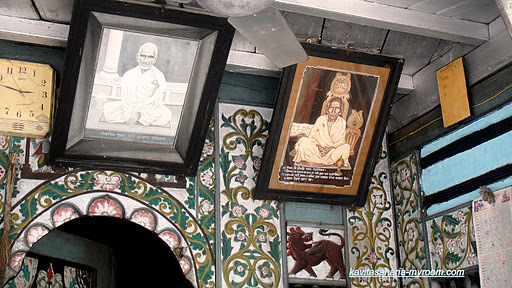 It is the sacred room where the Guru Asana (sacred throne) is located. Manikut literally means ‘house of jewels’. 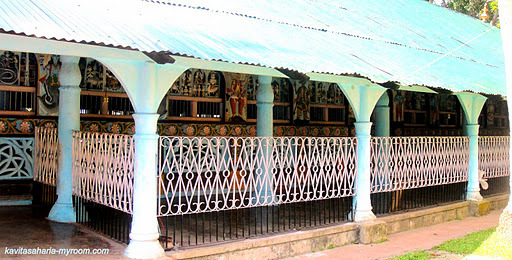 It is also here that the other-Satra valuables, wood carvings, metal works, ancient manuscripts etc. are housed. It is a sacred area and beyond a certain limit general devotees are not allowed in.I have pictures of Manikut entrance but not sharing it here on request . These Instituitions work both as the hub of religious learning and as residential schools.Here is a view of the assembly hall .The hall always faces the east. Satras have always encouraged the arts and crafts, like dance, drama, music, book-illustration for the beautification of the Satra interiors .The above carving depicts the scene from Ramayana .Those who are familiar with Ramayana can see the war between Laxman and Kumbhkaran , Hanuman bringing Sumeru Parvat ,Lord Rama and Lanka king Ravana. 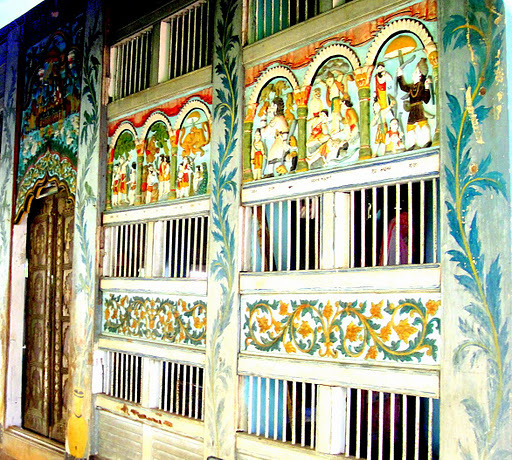 Doors with carvings of lion motifs are called Shimhaduar .The doors had beautiful brass work on them.Wish that the ripped paint and the dirt over the paintings were taken care of.We were told that soon this site is going to be developed as a tourist destination. Another panel depicting Sita Haran by Ravana ,the fight between Jatayu and Ravana and Sita at Ashok Vatika. 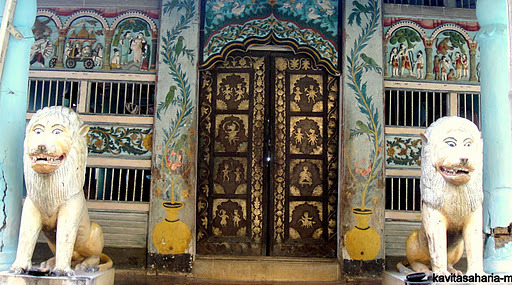 This is how the complete wood walls of the main prayer hall/assembly hall look like .The walls are usually left with railings or perforated wood carvings of devotional imagery, which allows light and air at the same timeThe floral carvings look gorgeous on closer look For many days I repeatedly kept on looking at the pictures of these amazing art work. From Ramayana : Lord Rama ,Laxman and the fight between Sugreeva and Baali. Because of time limit as we had to go to the Boat Race venue we could not see the carvings on the other side . These are the pictures of founder Satradhikars.As told by the present Satradhikar they are kown to have lived very long life . Later ‘Bhakats’ invited us to their kitchen for some light refreshments.Though the term ‘bhakat’ means any devotee -Many devotees live outside the Satra and generally lead a family life.The celibate Bhakats known as Kevaliaa which popularly applied to mean those devotees who either hold office of the Satra or lead the life of a celibate within the Satra campus.We were served Chira ,Curd topped with delicious cream and generous amount of sugar . info courtesy :attribute to sankardeva.org. Pukhuris or water tanks are used either for sacred or utility purposes. Each tank or pukhuri is allotted for a specific purpose such as rice washing,bathing etc. The environment around had a number of flowering and fruit bearing trees, which provide ample shade. The height of the main structures do not exceed those of the trees around them. Soon we had to rush as the procession towards the boat race was about to begin.We left the premises with a promise to the villagers that if possible we will visit this beautiful Satra again so as to see the interiors of the assembly hall which we missed this time. I will be away for a week visiting our ancestral village for celebrating Magh/Bhogali Bihu (harvest festival).I wish you all A Very Happy Bihu. 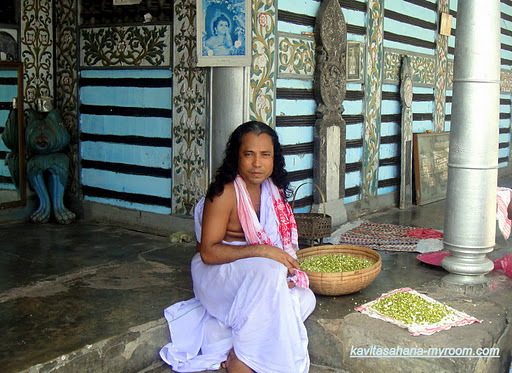 From → Sri Sri IswarHatiSatra Of Sualkutchi .Satras Of Assam. Kavita you are doing Assam real proud. I have been meaning to go to Majuli. My paternal grand parents were from there. Love the pictures and your narrative. Kavita you are doind Assam real proud by writing about the Satras. 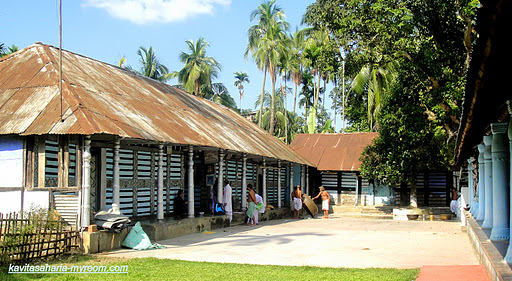 I have been meaning to go and visit Majuli for a long time. My paternal grand parents were form there. Great visiting your blog. Loved the pictures and your narrative. Kavita you are doing Assam real proud by writing about the Satras. 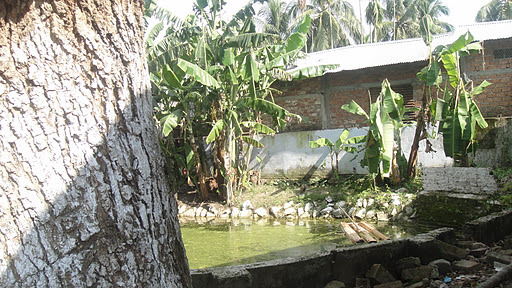 I have been meaning to go and visit Majuli for a long time. My paternal grand parents were form there. Great visiting your blog. Loved the pictures and your narrative. I learned so much from this post, Kavita! Your descriptions and your photos were both vivid and fascinating. So glad I stopped by today!Blessings! the carvings are so nice and colorful! « Magh Bihu 2012 : Fish Catching, Meji And A Sagolir Puwali .